September 1916 War Diary of the 1/4th Battalion Northumberland Fusiliers for the period when John Houseman was killed. HENENCOURT WOOD -Training of the Batt carried on with. The men are now getting very fit & taking a keen interest. Weather appalling and consequently training was much curtailed. Route marches where possible and worked into the training, sports in view of Brigade Sports which are to come off shortly. The DIV General came and inspected the transports of the Brigade. Ours was a very good show and we were complimented on the turn out. The Brigade sports which should have taken place today were put off until tomorrow, and were a great success. This batt did extremely well & carried off a large proportion of first & second places in a lot of events. At the conclusion the Brigadier presented the prizes. During the night of the 8th and early hours of the 9th the 5th and 6th Battalions moved up to positions just in rear of the front line. On the evening of the 9th inst the 149th Inf Bde took over part of the front line. The 5th Batt took over in the front line and the 6th Batt were in support. This Battalion moved off from HENECOURT WOOD at 3pm on 9th inst and proceeded via MILLENCOURT and ALBERT to BECOURT WOOD about 2 miles E of ALBERT. BECOURT WOOD - The Batt remained in BECOURT WOOD. Both Officers & NCO’s reconnoitred front & support lines both in the morning & the afternoon. On the night 11/12 Sept the 149th Inf Bde handed over part of the front line on the right to the 142nd Inf Bde (47th Div), the boundary between 47th & 50th DIV’s now running - Point S.3.d 2.8 in CLARKS TR (front line) - WINDMILL at S.9.c.3.9 - Road at S.14 b 1.5 - point on road at S.13 b 1.0 - road inclusive to 149th Inf Bde to X 24 a 8.8 - thence to point in Quadrangle TR at X 23 c 4.6. MAMETZ WOOD - Between the hours of 5 & 6 am the Batt moved by platoons to MAMETZ WOOD (S.W). During the whole day & also the following day the Batt was equipped with all materials to complete it’s full fighting order. At the C.O’s meetings all the battle formations, artillery arrangements etc were thoroughly gone into amongst officers. Brigadier Gen OVENS C.M.G took over command of the Bde. At 9.30 pm the Batt moved from MAMETZ WOOD via the “Quarry” & then overland to it’s battle position in the right hand sector of the Bde sector, namely from a point S.3 b 6.6 to S.3 b 0.5. The Battle formations were complete about 3 am. Coys running from right to left as follows. C coy, A coy, B coy, D coy. At 3 am The dispositions of the Bde were as follows. 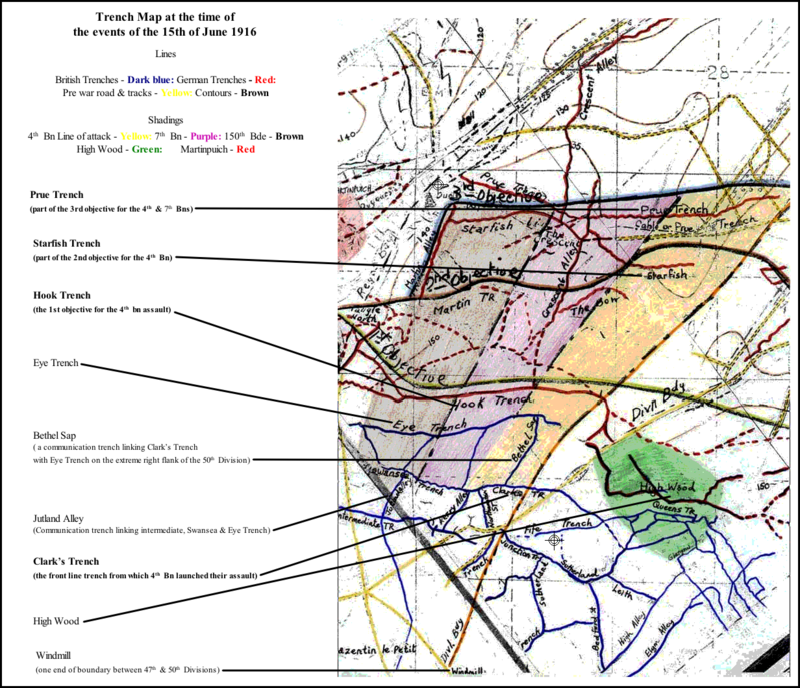 The 150th Bde occupied the left front & the 149th Bde the right front of the DIV sector. The 151st Bde was in DIV Reserve. The 47th Div were on the right & the 15th Div on the left of the 50th Div. The 18th Bn London Regt (London Irish) were on our immediate right with the 19th Batt in support to them. At Zero time 6.20 am the assaulting troops left their jumping off trenches for their first objective. Just in front of this assault two of the new tanks went forward on the extreme left of the 149th Inf Bde. This caused enemy to send up the S.O.S signals at once, which after 4 minutes brought down the enemy barrage in front of his own front line just before zero time. About 7.06 am a message was received from Capt Plummer from the left coy of the Batt front, that the 1st objective had ben gained without much opposition, & that he was in touch with D coy and the 7th N.F. Shortly after this wounded men began to come back, but no further messages were received from coys for some time. At 7.20 am message was received from Bde that the attck of 47th DIV on HIGH WOOD on our right was held up & that 2 more Batts were going forward. This meant our right flank had to be carefully watched as it was subject to enfilade fire and was up in the air. At 8.20 am a further message was received from Bde, saying left brigade of 47th DIV was trying to work round HIGH WOOD, & ordering the Batt to assist with Stokes Mortars and Lewis Guns from BETHEL SAP, a trench running at right angles to our jumping off trenches and up our extreme right. Col Gibson having no men in CLARKS TR wired for another coy to form defensive flank in BETHEL SAP, & sent 2 Lt Wilson to obtain information as to the position on the right of our first objective. 2 Lt Wilson reported that top of BETHEL SAP & right of first objective was swept by M.G fire from HIGH WOOD. Shortly after CAPT Demford 6th N.F & his coy were placed at the disposal of Col Gibson by O.C 7th N.F. Half this coy was sent to BETHEL SAP & half to the left of 1st objective to work along ½ right and form a defensive flank. At 9.45 am a message was received from Bde, saying, Division directed that HOOK TR must be made good & strengthened as far right as DIV Boundary. The strengthening of this & BETHEL SAP was completed as far as possible & the flank made secure. Bombing parties of Germans from HIGH WOOD were dispersed by our Machine, Lewis Gun and Stokes Mortar fire. At 10.35 am A coy of 5th N.F under Lt Daglish arrived & garrisoned CLARKS TR. At 10.40 am 2 Lt Wilson was again sent forward to obtain more information as to position in first objective. Half of Lt Daglish’s coy was sent up to 1st objective to bomb round HOOK on right and get in touch with BETHEL SAP. At 11.30 am Heavy Artillery bombarded N.W corner of HIGH WOOD and as the 47th DIV gradually worked round HIGH WOOD the enemy commenced retiring & were again caught by our M.G Fire. About 100 Germans, caught by this surrendered. HIGH WOOD was then cleared step by step. News of our frontal attack on our 2nd & 3rd objectives came in slowly, only disconnected statements from wounded men for some time being received. At 3.30 pm Col Gibson moved his H.Q forward to HOOK TR. This was badly knocked about. Men of the 4th 5th & a few of 7th N.F were found muddled up here. Col Gibson then organised the whole of this objective, getting all the various Battalions together & establishing connection on the extreme right with battalion of 47th DIV. At this period there were 100 men of 7th N.F in SUNKEN RD in front of HOOK TR. All men of the Bde further forward had become casualties, except a handful who withdrew with 2 Lt Browne about 1.30 am (16th inst) on the arrival of part of 47th DIV. This was the situation at dusk, & the position of affairs that was reported to Bde. 4.45 am a message was received from Brigade, stating 151st Bde were making every effort to occupy and consolidate STARFISH LINE (2nd objective). 6.45 am further message was received that 151st Bde would seize & occupy PRUE TR at 9.25 am after a 15 minutes bombardment. This attack did not succeed. During this time the Batt with H.Q maintained it’s position HOOK TR which was consisitently shelled with 5.9’s. From subsequent information it runs clear that the 4th N.F took part of the 2nd objective, and advanced to the 3rd objective (PRUE TR) on the morning of 15th. Both these trenches were evacuated by the enemy on the attack, & only held afterwards at each end of our front by M.G’s & bombers. In the afternoon 149th Inf Bde went into DIV Reserve & the Batt left HOOK TR for MAMETZ WOOD. The Batt was congratulated in very flattering terms by the G.O.C Bde & Division for it’s conduct on the action of the 15th. At 12.12 am a message was received that a counter attack was to be expected in the neighbourhood of HIGH WOOD, and the Batt “Stood to”, but nothing developed. A draft of 30 men joined the battalion. Casualties were checked as far as possible and a trench strength got out at Officers 17, O.R’s 262. Incorporated in this were officers who had been kept back at the transport lines & reserve specialists. The remainder of the day and also the next were spent in re-equipping the Batt.